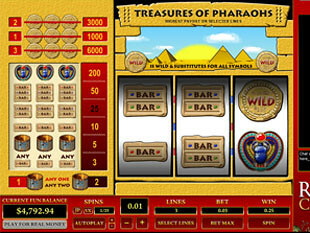 Treasure of Pharaohs 3 Lines Slots is a 3 reel 3 line slot launched by Top Game. Playing Treasure of Pharaohs you will find on the reels the following symbols, which constitute 9 winning combinations: Bracelet, Coin, Double BAR, Scarab Amulet, Single BAR, Triple BAR. All symbols perfectly match the Ancient Egypt theme. And in the paytable on the right of the screen you will see all possible winning combinations and also your win amount after each spin. The slot offers a 6,000 coin top jackpot and a wild symbol. Treasure of Pharaohs gives you an opportunity to bet the minimum stake of $0.01 if you are a fan of penny slots. The coin range is very wide, it starts from $0.01 and goes up to $5.00. Also you can chose the amount of active playlines for every spin. The maximum stake in Treasure of Pharaohs will be $15. 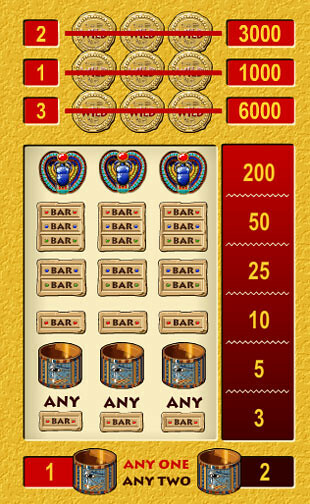 The highest Treasure of Pharaohs 3 Lines jackpot is 6,000 coins or $30,000 for 3 Coins if you play with 3 coins per line. The second Treasure of Pharaohs 3 Lines jackpot is 3,000 coins or $15,000 for 3 Coins if you play with 2 coins per line. The third Treasure of Pharaohs 3 Lines jackpot is 1,000 coins or $5,000 for 3 Coins if you play with 1 coin per line. Coin is the wild symbol and it substitutes for any other icon in a winning combination. Coin is a very important symbol as it constitutes all the jackpots. Three wilds on the third payline will award you 6,000 coins or $30,000. Catching three wilds on the first payline means that you have won 3,000 coins or $15,000 and if you trigger them on the second payline you will earn 1,000 coins or $5,000. If you happen to trigger three Scarab Amulets on any of the active paylines you will win 200 coins or $1,500. Scarab Amulet is the highest non-jackpot symbol in Treasure of Pharaohs slots. However if you catch 3 Triple BAR icons you will be awarded 50 coins which is also a very flattering amount. During the game you can also use the auto spins feature and observe the machine spin for you more and more winning combos. The gambling industry of today progresses with giant steps and always offers more and more options, ideas and of course new slots. Today you may find many modern video and progressive slots with numerous paylines and enlarged amount of reels. But if you are seeking for some relaxation and a bit of simplicity or maybe if sometimes you get a wish just to stop the time for a moment and to remember “how it was”, you definitely need to check out Treasure of Pharaohs 3 Lines classic slots. Releasing a sophisticated classic slots Treasure of Pharaohs, Top Game, with an endless care to the costumers and their wishes, presents an opportunity to feel like you can stop the time and jump into the history. Treasure of Pharaohs works on Top Game software platform which guarantees the excellent playability and easy navigation, interesting design and dynamic gaming. Try Treasure of Pharaohs slot machine and experience all the benefits and excitement of today’s online gambling.